It all started in the Summer of 2012, just before National Seminar in Cincinnati, Ohio. Composer James Meredith and Handbell Musicians of America executive director Jennifer Cauhorn, insipired by the virtual vocal choir projects, began discussing what it would take to do such a project with handbells. Meredith composed the piece "Misterium," but allowed no one to see the actual score until the final video was complete. He disassembled the music into individual segments, some consisting of a single sforzando bass note or extended singing bell note, and some consisting of alternating eighth or quarter notes and even portions of the melody and harmony lines. The idea was that there would be segments that could be played by handbell musicians of all levels and experience; some could even be performed by a person picking up a bell for the first time. 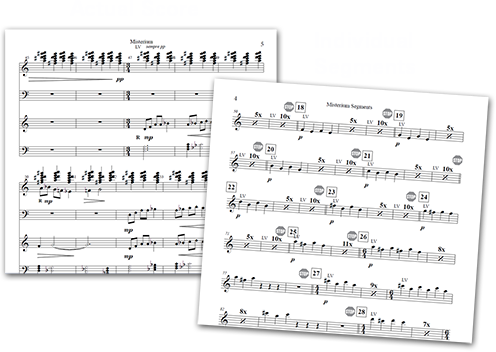 A document with just the individual segments, along with a tempo track recording, were uploaded to this website, and handbell musicians around the world were invited to record themselves performing any number of the segments. Over the next eight months, more than 400 handbell musicians submitted nearly 600 individual video clips. Players spanned all age groups from elementary school age to long-time retirees. There were musicians from church choirs, community groups, and schools, as well as soloists. They played indoors and out, formally dressed and in costume, and in any number of interesting stagings, from lounging by the pool or playing on a swing to lying in fall leaves or hanging upside down. After the submissions closed in April, came the task of assembling all the footage into one video and layering the audio to make the performance resemble a single mass ensemble. Working with Meredith's score, Alan Greeb mapped a chart outlining where each clip should be placed and which clips needed to play together. Office staff Sandy Greeb, Shelly Horn, and Jennifer Cauhorn meanwhile sifted through all the nearly 600 clips to identify which segment each represented and organized them for the sound editor, Michéle Sharik, and video editor, J.R. Smith. 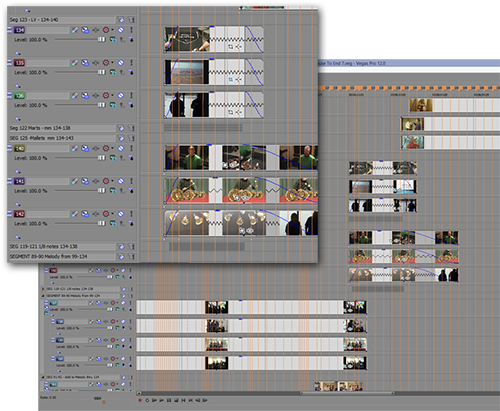 Because the editing would take so much time, the audio and video were assembled at the same time in different locations. The Agape Ringers generously donated some of their studio time to make a sample recording so that the sound and video editors would have an identical framework from which to build both the audio and video portions of the work. Since the individual clips were shot with all sorts of devices, from cell phones to high-end video cameras, and in every conceivable shooting condition, many challenges were met by the sound editor to achieve a uniform sound. Using the recording as a guide, each piece was layered into the mix to exactly match the correct timing. Some clips had as many as 10 or more submissions, while others had only two or three, so levels had to be manipulated to achieve an even volume. Since videos were shot in all sorts of situations, extraneous noise, such as wind, camera noise, the occasional clank, and other background noises needed to be carefully removed. And since they were shot on all types of devices, the sound needed to be equalized and further manipulated to achieve an even timbre throughout the piece. While the audio was being manipulated, the video editor worked to build the picture itself. An overall look of floating in a dark, nebula-like cloud was conceived to match the mood of the piece and its title, "Misterium." Sketches were made for each section of the music with a general idea for the placement of melody lines and the various accompanying parts. Unlike the virtual vocal choirs, each musician did not record the entire piece, so a grid with all the players on screen at all times could not be used. Each clip needed to appear only during the piece of music where it belonged, then needed to disappear from the screen. Layer by layer, each clip was added and effects applied to bring them into and out of the shot in a way that enhanced the music at that point. When both the audio and video portions were complete, the sample recording was removed and the mass ensemble recording was added to complete the work. Virtual Handbell Ensemble is an exciting new project of the Handbell Musicians of America, in which you will have the opportunity to perform a new work of music via video uploads. Misterium, by James Meredith, consists of 135 musical segments to be recorded separately by individuals and small groups of players from around the world over a seven month period and uploaded to the web. All of the segments will be assembled by the editing videographer and the composer into the final work to be premiered online in July, 2013. The players may opt to record any or all of the individual segments to the set tempo of the click tracks, which can be downloaded along with the segments HERE. Except for the segments needing more than one person, most are meant to be performed standing away from tables. We encourage you to be creative in your filming. Find a place as quiet as possible indoors or out. Choose a background which does not detract from you. You may film very close up, at a distance, from the side, front or overhead but make your performance interesting. The more interesting, the more likely your clips will be prominent in the final video collage. In other words, don’t look like robotic automatons! Let’s show the world how exciting handbells can be to watch and listen. After the online premiere, the score will be published so that any groups interested can perform the work designed for double ensemble. So, grab your cameras, round up your handbell buddies, and start recording. Deadline for submissions is APRIL 1, 2013. The style of ringing that we do is descended from change ringing, a practice originating in England. This was a secular practice. Bells were hung in church towers since they were the highest places around. As ‘tune ringing’ took hold, especially in America, the church was the ideal place for handbells to find a home. In homage to this history, the French plainchant melody adoro devote plays a large part of the composition of the work, though greatly transformed in the process. The sound of bells throughout history, within different cultures, has always had an air of mystery. The title of this work reflects that feeling and the extensive use of the ‘singing bell’ technique connects to an ancient Asian tradition. The playing of handbells is a group endeavor. An interesting sociological study could be made on handbell playing as a microcosm for the community, with all its joys and challenges. To further that analogy, Misterium was written for two handbell ensembles to broaden the community involved. The mystery is continued as none of the participating players will know what the final composition will sound like until it is put together in the video editing studio and premiered a year from now. The work is a soundscape of overlapping sonorities, rhythms and textures. As the composer, I know what it sounds like in my imagination but the final sound is up to your performances. Copyright (c) 2012 Handbell Musicians of America. All rights reserved. Design by FCT.